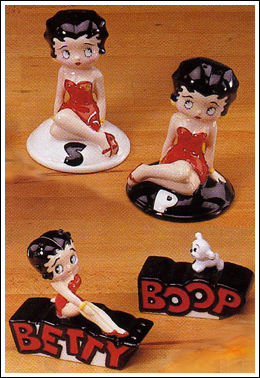 This fun collection of Betty kitchen goodies includes 2 pair of ceramic salt & pepper shakers. See Betty and Pudgy perched atop our gal’s name (Betty is almost 4” H). If you prefer all Betty, then you can have her sitting in a classic sultry pose on both the salt and pepper (a bit over 4”).